The crankshafts may set the limits. Three engine manufacturers have come to dominate the market for the giant low-speed two-stroke diesel engines used in the largest container ships, bulk carriers, and tankers: MAN SE of Germany, Mitsubishi Heavy Industries of Japan, and Wärtsilä of Finland. Stricter environmental legislation around the world is only part of the increasingly more challenging environment these three firms – and the shipyards and contractors they work with – have to deal with. The shipping industry does not merely demand cleaner and more fuel-efficient engines, but also engines that will last the design life of the ship (usually 25 years) with only scheduled maintenance and minimal repairs. Several shipowners (led by CMA CGM) are coming to like the single engine/single propeller configuration for its efficiency and reduced running costs – as long as it doesn’t impact cruising speed too much. Technical solutions range from the use of plates of corrosion-resistant materials such as Inconel (a family of nickel-based super-alloys originally developed for jet engines) welded to the piston crown to using crankcase oil to cool not just the pistons themselves but the rod as well to reduce the likelihood of heat-induced failures. To give an example of what the shipping industry demands nowadays, Maersk’s Triple-E container ships – the largest container ships in the world with a capacity of over 18,000 twenty-foot-container equivalent units (TEU) – are powered by two MAN two-stroke diesels, each driving its own propeller. Each engine has eight cylinders with an 800 mm bore. The engines are designed to deliver their maximum efficiency at 73 rpm. Their combined power of 59,000 kW allows the monster-ship to cruise at 16 knots. These MAN engines are not the most efficient offering from the German firm, and there are several single engines that put out a lot more power. For example, the much celebrated 14 cylinder version of the Wärtsilä RTA96C is rated for over 80,000kW. But MAN’s twin-engine configuration allows to reduce engine room size relative to the size of the ship, thus giving more room for cargo. It allows to install one 3000 kW electric generator per shaft, thus almost doubling power from thermal-fired generators and the waste heat recovery (WHR) system. This increased electricity generation allows each Triple-E ship to carry up to 1,800 climate-controlled containers, a huge boon when carrying heat-sensitive cargo (such as some electronic components) through the hot Indian Ocean. The Triple-E 25-year design lifespan may be cut short if there are technical breakthroughs that make the ships uneconomical to run, repair, or retrofit. So, just in case, according to both Maersk and Daewoo, the Triple-E were designed to be “easy to break up” when their time comes, but until that day comes we won’t know how much truth there is in this statement. All of this comes at a price. Each of the three series of 10 Triple E container ships cost Maersk $1.9 billion, bringing the total for all 30 ships to US $5.7 billion in 2016 dollars. This is the largest contract ever for commercial vessels of any kind. The ferocious competition between Asian shipyards, and especially the Big Three of Korea (Daewoo, Hyundai, and Samsung) allowed Maersk to get excellent financial conditions on hull construction and system assembly/integration. Each ship took about a year to build (Daewoo has large enough facilities to build three such ships at a time). Maersk obtained both a two-year warranty (other shipyards offer one-year warranties) and a so called “tail-heavy” payment: 40% during construction and 60% after Maersk has conducted sea trials after delivery. Hence it should not come as a surprise that in late 2016 Daewoo was caught in a massive accounting scandal. It was discovered that the firm, instead of being profitable, had accumulated dizzying losses in 2015 and 2016 of 6 trillion won ($4.8 billion). Only a direct government loan of US $2.6 billion in March 2017 allowed Daewoo to avoid bankruptcy. And challenges in the industry abound. In 2016 MAN released the result of a study it had carried out at a time single-engine configurations were becoming attractive even for gargantuan projects after the success of the Wärtsilä RTA96C. MAN said the computer simulations and theoretical studies found only one real challenge for building straight engines with as many as 18 cylinders and pistons with a bore as wide as 1200 mm. As a comparison the largest version of the RTA96C “only” has fourteen cylinders and a piston bore of 960 mm. 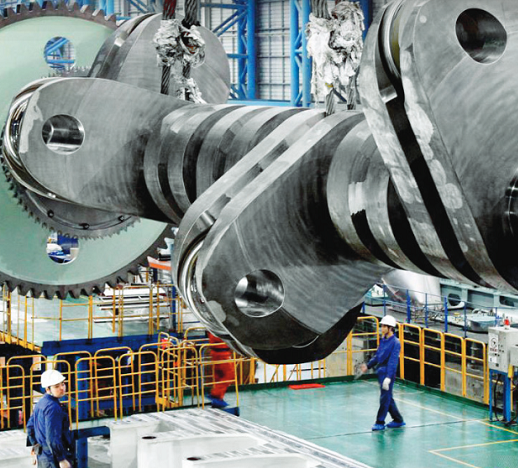 That challenges, which may become a deal-breaker, is building the colossal crankshafts required for these monster engines. The largest crankshafts produced so far for marine engines are built in three sections, each of which has to be machined from a huge cast part of forged steel to truly exacting standards of precision. There are only four firms in the world that can cast and machine these crankshafts: HSD Mechatronics and Hyundai Heavy Industries of Korea, Sidenor of Spain, and Kobe Steel (KOBELCO) of Japan. The process is expensive and time-consuming. The crankshaft is by far the most expensive part of these marine engines and, unless there’s some technological breakthrough, may be what will limit the size that piston engines may reach. Crankshafts are just one of the many parts in an engine that can fail. Modern engines are designed for being mostly serviced in situ. Shipowners now demand most repairs to be carried out with minimal downtime, for example during an ordinary harbor stop. Companies such as Goltens, to name but the most famous, specialize not merely in offering shipboard repairs but also in-situ machining, annealing, and even line boring to cut this downtime to the absolute minimum and thus allow shipowners to maintain their contractual obligations. The crankshaft from a cruise-ship diesel engine can be replaced in as little as 12 hours during a scheduled harbor stop and without cutting the watertight bulkheads, thus not impacting operations. Amazing. I hope this gave a small peek into some of the challenges of the shipping industry. The challenges ahead are huge, but human ingenuity seems to know no bounds when stimulated the right way. By MC01, a frequent commenter on WOLF STREET. When I was little kid living in Beloit WI, Colt’s engine plant had a massive muffler outside x2 as tall as the manufacturing building. When they would test fire an engine (nuke sub backup engine etc) the ground in the near vicinity would shake violently. My wife’s uncle was a machinist in that plant and I have toured it multiple times. The scale of those engines, while not as big as the marine diesels in the article, are incredible! I was fortunate on one visit to see one start and run. Awesome engine! 18,000 plus TEU’S on one propeller, is not an environmentally safe, ship design. “… two-stroke …” all in the name of consumption of things…sickening… we really are committing suicide. It is interesting that these behemoths are still two stroke designs burning cheap bunker oil. Going to four stroke designs would improve emissions but power density would suffer. I’m sure the EPA is working on diesel particulate filter and urea injection requirements for these monsters. These things are predominantly outside the jurisdiction of the EPA. They have run on Bunker for so long as to date nobody has stood up and said Hey what about. thissi changing quickly as they will hav e to. Cheaper and simpler to run them on NG/LPG than add all those emission elements to what must for various reasons, be as simple as possible, engine systems. More pollution is put out by those ships then all the cars in the world. They started with cars in the late 60’s. Think how much pollution could have been avoided, in the following HALF A CENTURY if they had started on international Maritime vessels at the same time. It is Calculated that Maritime Shipping puts out more pollution than Germany, annual. How much of that is so Corprates can save on labour costs, by exporting jobs to dirty china and india. When they started on clean air, they first went after Soots. As you could see them. They missed CO2 and Methane. What they still will not admit, is they got it back to front. First they should have attacked CO2 and Methane, as they were the green house gasses. Instead they stripped away the Soots that were helping to alleviate the effects of the green house gasses by providing a sun screen. That they made a mistake is not the issue, that they will not admit it, IS. I’ll try to answer without being too technical. The reason why two stroke otto engines have such a bad emission record is because the crankshaft bearings are lubricated by oil mixed with the fuel/air mixture. This leads to a lot unburnt fuel/air/oil mix being released into the atmosphere. By contrast two stroke diesel have their crankshaft bearings lubricated by pressurized oil, just like an ordinary four stroke engine. In modern two stroke diesels the bulk of the pollution comes from the fuel itself. Yes, there are ways to reduce it, but when you burn thousands of liters of oil only a little less dense than bitumen per hour you cannot have just baby foxes coming out of the exhaust. The EPA cannot do anything about these ships, as the US are bound by law to the MARPOL protocol, whose details will be explained in a forthcoming piece. Any change to it has to be negotiated with a plethora of international partners and legislating bodies, like it has been done so far. California requires container ships to switch to low-sulfur fuel within 24 miles of the coast. In some coastal counties these vessels account for 50 percent of NOx emissions. There is also a speed-reduction incentive program that pays vessels for slowing down in coastal areas to reduce emissions. Thanks for the post/contribution. Cool stuff, well written. 2 stroke engines are more efficient than 4 strokes, and they don’t use bunker oil. Bunker oil or furnace fuel oil as we called it in the navy is reserved for external combustion engines. Big cargo ships use various grades of bunker. We’ll post an article on this in a couple of days. Many fast navy ships have gas turbines — and since before WWI had steam turbines — instead of piston engines, and they use a different fuel. WWII subs had 2-stroke diesel engines. They were diesel-electrics with no connection between the diesel engines and the electric motors that drove the props. I was basically a tour guide on the Bowfin in Pearl Harbor for a year or so. Diesel boats are cool! The Titanic had triple expansion reciprocating engines for the port and starboard screws and a a centerline turbine for the center screw. The business decision to compete on luxury and size rather than speed drove this design. In the NAVY being the words of relevance. Two stroke engines have a simpler valve train, but require a blower in order to combine the intake/exhaust/compression strokes into one. They run at slower revolutions/min which is probably a necessity to completely burn the cheap and heavy fuel oil. Slower speed also allows the engines to connect directly to a propeller without a transmission between. I think big diesels run slow for two reasons. Because diesel fuel is injected at a metered rate it takes notable amount of time for it to burn completely inside the huge cylinders. And because at that scale the mechanical resonance of the engine parts are low frequency. So if you ran it fast, it combustion wouldn’t complete. And harmonics in the engine would destroy it. The Wärtsilä RTA96C operates at 22-120 RPM! To put that into perspective, Otto-cycle (gas) car engines idle at 500-1000 RPM. Bore and stroke are 37.75 in. by 8.4 ft, so a man could stand inside of the combustion chamber with room to spare. Every other cycle is a power cycle in a 2 stroke engine, which allows them to run at a slower speed. Thanks MC01. Interesting information. Two-stroke diesel? Sounds like a pollution machine. The sweet spot of over the road diesel engine technology was around 2000-2004 with reasonable emission requirements and excellent fuel efficiency. With tier 4 and later emission requirements, fuel consumption went up about 8-10% and maintenance costs surged due to exhaust gas recirculation (EGR), diesel particulate filters (DPFs) that require raw fuel injection into the filter to burn off particulate and Urea injection. There is such a thing as regulatory overreach. You know what I’m taking about if you have ever used one of the new EPA mandated fuel canisters. I have spilled more fuel with these vent-less contraptions. Good thing they can (still) be retrofitted with the old spouts and vents. RE: single engines on monster ships. Some experts in maritime disasters disapprove of a single power source. They don’t fail often but they do, and then the ship can only drift. At least in theory, though, nowadays if the engine quits they can yelp for help on the radio. Nick makes a good point. When one quits it’s typically in the midst of a raging storm. Good luck with a phone call. A very excellent article and commentary, Wolf. Another good topic to explore is the economics of sea-going tugs…. What Economics, Ocean salvage tugs are a necessity. Economic High performance, is an oxy moron. You buy fuel, a calculate usage, by the 10’s of Tons. Any salvage or heavy weight service Vehicle or Vessel is inherently fuel inefficient, due to the tasks it is required to undertake. One I worked on was required to regularly undertake a 1 hour full power pull test. They tie it to a bollard on a Warf/Pier then (Try) to operate it a full power for 1 hour. Normally it fails then gets a calculated pass after an argument as normally after about 20 minutes it pulls the end off the Warf/Pier down or pulls the bollard off the end of the Warf/Pier. When Empty, not towing, in good weather, it could attain Maximum hull speed on 1 of its 4 Massive Detroit/MTU Turbocharged Engines. The only trouble we ever had with those engines was Cylinder head cracking, as Detroit cast a faulty batch of heads, and we had some. They replaced them as they cracked, under warranty. Time consuming but not difficult job replacing them as it had a large engine room. Basically it was a floating engine room, with fuel-tanks (2000 tons plus was the smallest), and a winch attached to it. That type of vessel can tow loaded 20,000 TEU carries around the world, and laugh. Based in Australia now, used to be based in NZ, till the Aussies brought the company. They Demanded the crew base in Australia, as a way of getting rid of most of the Non Aussie members. No money on that Job for the workers, at Aussie tax rates. Most off us on it, were previously officially stateless for tax purposes. Now we need to work on cleaner Fuel Usage Issues. IIRC, the “cheap and dirty” Fuel were used in Intl Waters. Pity the Petroleum KleptOchlarchs killed off Mister Diesel, who designed his engine to run on Plant based Oils. Generally speaking, Conventionally Powered US Navy Ships used a standard quality of what we referred to as DFM – Diesel Fuel, Marine; and comparable quality fuel were purchased when abroad. After Retiring from a 20 Year Active Duty Career in ’61, my Late Father spent his 2nd 20 Years for the Navy in the Auxillary Fleet of Tankers, Oilers, Oceanographic, and Supply Ships manned by Civil Service Sailors. I recall him giving us a quick tour of some of his Ships he worked onboard. He even Sailed to Antarctica on Operation Deep Freeze once. Funny seeing years myself as a young Logistics Ensign on a Cruiser in the same Fleet, same Port, and Refueling off the very Ships he used to Sail on. My Father Retired from the Aux Fleet a few years before I became Commissioned. I had a few Midshipman Cruises in the Pacific; but they were on Nuke Subs. Fate sent me back home – I was all set on chasing Bikini-clad Dames in SoCal or Hawaii; but Logistics School Options had Seal Team Six, Nuclear Reactors Support – yet no Attack Submarine (Father was a Submariner) or F-18 Squadron. I was in an Ensign Pool until someone in Japan was fired. I spoke the Language, I suggested they send others who never left their home state before joining the Navy, yet they sent me anyway. I Sailed the Seas, even into War Zones on Convoy Duty (Iran-Iraq War), and at the end of my Tour, helped my Parents move to the States. Even had one of those Massive Tankers we escorted save us from a Mine (Bridgetown). Prior to that incident, a Warship took the Lead Positon of Convoys. I was hoping for some, hard, accurate, unbiased, fuel consumption and emission Data. Also so comparisons between normal Diesel, and Bunker oil fueled vessels. From more accurate Sources, than those found in Search. We’ll publish an article on bunker in a few days. I already have the draft in front of me. These are big topics, one at a time. Fuel consumption figures depend to some extent on the ship and speed. Just a like a car. You can put the same engine in a compact car or in an SUV, and fuel consumption will change a lot (weight, aerodynamics etc.) Similar for ships. There are specs for how much fuel a big diesel like this burns in an hour, but that’s just fuel consumption per hour. Fuel economy involves what it accomplishes with this amount of fuel over this time period. A ship with better fuel economy might haul more payload over the same distance at the same speed, and versions thereof. After we publish the somewhat complicated article on bunker, MCO1 might consider doing an article on fuel economy and the issues involved, including speed, size, etc. One topic at a time. This area (Bunker) is important and has been missing in the Warming debate, Environmental regulations, for far to long. In a 24 hour day at this 60% output, it adds up to 200,000 kg of fuel used. The RTA96C has a rating of 80,080 kilowatts and using the conversion of 1 horsepower = 745.7 watts, that’s 1078,389 ponies! What can I say, I’m a semi-retired motor head with a physics degree who likes to crunch numbers. Gotta re-read my notes as 13,736 kg/hour is at maximum output. At 60%, with 170g/kWh efficiency the number is 8,240 kg per hour. Thank you MC01 and Wolf for publishing this! Ok, one more correction 107,390 hp. Great article. Thanks Wolf for posting. MCO1: What happened to Sulzer Brothers of Winterthur, Switzerland and Burmeister-Wain in Copenhagen? Are they out of the business of large diesel engine manufacture? Crankshafts: The process of manufacture, I witnessed at Kobe steel in Japan was as follows: The crankshaft journals, webs, and crankpins were forged and machined as separate pieces. The crankshaft was then built-up vertically by heating the webs and shrink fitting them to the crankpins and journals. The mating parts being highly polished to secure a good contact of fit. I asked how they could assure the accuracy of the angles of the throws by this method? They told me they just had to get it close, as the engine had adjustable cams operating the fuel injectors and any angular error in the throws is corrected by the fuel cam adjustment. Fuel Consumption: A ships fuel consumption varies as the cube of the speed. Double the speed and you will burn 8 times the amount of fuel. I worked on a steam turbine powered ship (36,000 shp) which burned about 200 tons/day at full power. Current fuel prices for bunker fuel are about $425/ton at Houston. 200 tons = 1300 bbl. = 55,000 gal./day which translates into $85,000/day fuel costs. Serious money. A large bore diesel of the same horsepower will burn less than 1/2 that number. You can see why they are used. Burmeister & Wain became part of MAN in 1980. Hence the “MAN B&W,” whose crankshaft is shown in the photo in the article. The first thing I told myself when writing this piece was to avoid being too technical. This is meant to be an introduction, not a direct comparison between engines, propulsion systems, hull types and auxilliary systems such as waste heat recovery. If you need such a thing you probably already work for Maersk, MSC or COSCO. It’s a very good, and interesting, article. Thanks. What came to my mind was the lack of diversity in manufacturing.. Only one firm is outside the area of potential conflict with N Korea can manufacture these big cranks. Just another glitch in globalization. This is not a glitch. In fact I am surprised there four firms able to do this job and not just one. The reasons are simple: the investments, facilities and know-how needed to manufacture these things are simply staggering. These modern crankshafts have each throw manufactured from a single casting (semi-built crankcases) while in the past each throw was assembled from separate webs and crankpins (fully-built crankcases). Consider that each throw can weigh more than ten tons and has to be machined to truly exacting standards of precision. Just to give an example the bores for the main journals (which are shrink fit) have an allowance of less than 1/600 of the diameter. In the late 80’s MAN tried to introduce welded crankshafts, which used much smaller cast parts and had the advantage of continous grain flow (meaning the crankshaft could be made lighter without sacrificing reliability). The submerged arc welding system used was a true wonder of engineering. Yet MAN stopped after just twenty crankshafts. Why? Because the process was so expensive it could not compete with neither fully-built nor semi-built crankshafts and, albeit these crankshafts have proven very reliable, the extra cost could not be justified. I wonder if these crankshafts are a future candidate for 3d printing? I am too old and stodgy to really get into 3D printing. As Confucian scholars are wont to say “We have to leave something for future generations to do”. Plus I was trained as a chemist, not as an engineer or CAD designer, so all my knowledge about 3D printing comes from hearing other people talk or the occasional piece I read. I know there are now several prototypes of metal 3D printers that are designed to work on very large pieces, up to one metric ton in weight. I have no idea how close these prototypes are to being even remotely commercialy viable nor of how they compete with casting and machining when it comes to the bottom line (costs). Mind these crankshafts are usually made from HSLA (High Strength Low Alloy) steel, not the nodular cast steel now favored by the automotive industry for the same applications and I haven’t heard about HSLA steel being used in 3D printing so far but, as said, I am not exactly in the loop. I hope some young up and coming engineer or metal chemist will drop in soon to fill us in with the details. In a prior life I worked for a group that manufactured machines that used large one piece forged cranks. Largest crank was around 15 tons with counterweights and 20 inch throws. That’s small compared to those marine diesel cranks. Even with the ‘medium’ sized cranks, the number of manufactures are pretty limited and the price is pretty high. At one time the USA had shops that could build those cranks. That’s long past. We had looked at Vítkovice Heavy Machinery in Czech Republic. They were doing large cranks for marine engines at the time. Don’t know if they still are. We eventually settled on assembled crankshaft using oil injection method for assembly. This lowered the crankshaft cost by 40% and allowed the use of lower cost one piece bearings on the throw pins and center mains. This was like watching a documentary, interesting but in the “I will ever need to know this for trivia” kind of way. Thank you for the information. I had no clue container ships were so expensive. Now even if Wind power and Solar power starts to become way cheaper than any other fuel source in a few years, these ships will still need fuel. Looks like transport in the sea will be lagging behind about being green. And where are the solar powered trains dang it? That is just one example of how dependent the U.S. is on foreign heavy industry. We can only go so far on tattoo parlors, law firms, nail salons, check cashing stores, and Snapchat. My interest was centered on the same two statements. It brought to mind the old Bethlehem Steel plant in Pennsylvania. I got to see it before it was dismantled and turned into a casino. I hope that casino can make up for gaps in the global supply chain when all hell breaks loose. I remember reading somewhere that there is no longer a U.S. producer of the transformers used in the electric grid and that the majority are made in Korea, with a very long lead time in production and transportation. To say that our politicians have dropped the ball on critical parts of national security infrastructure would be an extreme understatement. That is true, Even GE Canada and GE Brazil have now gone out of that business. A very serious problem. the lead time for a big transformer is 18 months or more. This would be a security issue only if the US was embargoed for years by all four. This niche business is not typical of the machine industry, it is highly unusual. Very unusual size cranks, with two or three customers. It would make no commercial sense for a fifth player to enter, unless of course it could get tariffs on the other four. Then there is the plight of Hershey that is supplied with that ultra-thin foil for chocolates by a foreign outfit, which may be hit by tariffs. the other outfit which is selling world wide, leaving not much for either of you. But I agree with your main point: the structure of the US (and Canadian) economies is out of whack. One point from today’s Globe and Mail: the size of the total real estate sector: construction, financing, sales, legal etc., is now two standard deviations from the historical mean. PS: total RE sector is total Canadian sector. One thing that makes the U.S. unique at the moment is the sheer amount of capital being burnt up in obvious scam companies like Tesla, Snapchat, Netflix, Uber, etc. and on spending of dubious value like student loans for college. When capital is destroyed this way it crowds out spending on key capital assets that are important for a nation’s long term success. I don’t think any other country can match the U.S. in this ignominious distinction! Facscinating and worthwhile, MC01; thanks for the article! Let me second that John. Wolf’s blog is countering our rapid degeneration into a cargo cult. Very very interesting article. I realize such low rpm and finely machined components ensure that engine failure is unlikely, however, two engines might keep one of these monsters off the rocks. massive sea-going rescue tugs aren’t always readily available in most of the world. Just my opinion, but it isn’t enough of a reason to cite expense and high seas to get a pass on pollution. Bunker C is way past its time and mankind needs to power transport with cleaner fuels. Of course I can name a major consuming nation whose leadership does not accept climate change and is actively promoting coal. Oh well. The single/double engine issue is very similar to the number of engines used in jetliners. Still in 1980, when Airbus had already been selling the A300 for four years and Boeing was designing the 767, the idea that twinjets could carry passengers safely over the Atlantic, let alone Pacific, Ocean was still so outrageous even the FAA was publicly against it despite the damage it would have caused to Boeing, Pratt & Whitney and General Electric, all US companies with very strong lobbying arms. Then came ETOPS and now twinjet widebodies such as the Airbus A330 and Boeing 777 are the mainstays of long-distance flying. These days Korean Air flies their Dreamliner twins non-stop between Madrid and Seoul three times per week, with a flying time of over 12 hours. Nobody bats an eyelid. Shipping companies such as Maersk and MSC know perfectly well the costs of having a stranded ship. Insurance, recovery, repairs and especially making customers whole are not merely big but huge costs that need to be cut down as much as possible otherwise they’ll impact not merely financials but operations as well. And as COSCO learned, environmental cleanup and fines can add a big fat layer of costs. Here is one way it’s different. A modern twin jet can fly on one: the old regs were for piston twins that could barely do so. So two minus one is one. which is doable. But one minus one is zero, which is a disaster. In 1954 the FAA restricted jets with less than four engines specifically to never being more than sixty minutes of flight away from an airport. This was the so-called sixty minutes rule and the reason why Boeing developed the 720 from the 707 for medium range routes as a stop-gap measure while they worked to have FAA wave this rule for three-engined aircraft. This paved the way for the highly successful 727, the successful McDonnel-Douglas DC10 and the… well, not so successful Lockheed Tristar, the aircraft that almost sank Lockheed and Rolls-Royce at the same time. Your article was nicely written but it has a few inaccuracies or slight omissions that generated several comments which made me chuckle. Not sure why the article makes an issue about ships lacking main engine redundancy, as if this is something new. I believe using an airplane to be a very poor example. Ships are not on par with planes when propulsion is lost. As i understand it, hydrodynamic platforms float on liquid. While aeronautic platforms require fluid flow over the wing to stay aloft in air. In short, lost propulsion = ships float and planes crash. Historically, the vast majority of large commercial ocean going deep sea bulk, container & tank ship vessels are propelled by a single fixed screw, single direct connected multi-cylinder in-line slow speed 2 stroke direct reversing crosshead type diesel engine. This is based upon pure economics of cost/profit, from construction/operation and return due via viable freight space. Passenger ships utilize multi-engine diesel electric configurations due to flexibility as they have a very high “hotel electrical” load, strong need for lower propulsion to hull vibration transmission and the ability to disperse power generation away from having a large single central space, as other forms of ocean freight transport employ. I’ve also worked on some what smaller vessels (650 foot long) that utilized multi-diesel 4 stroke medium speed engines that either had 2 engines clutched to one set of reversing/reduction gear (efficient engine speed is higher than efficient propeller speed) or it had a CPP (controllable pitch propeller) or twin screw where each medium speed engine had its own reversing/reduction gear coupled via clutch to its own propeller line shafting. When compared to a direct coupled slow speed diesel, each multi engine arrangement requires more equipment and sub systems for support, which take up potential cargo space, have higher initial costs for procurement and installation along with increased life time maintenance costs. Its cheaper and law of average for component failure being lower to maintain 1 huge 9 cylinder in-line main engine then 2 smaller V-18 cylinder type main engines. Bottom line; large 2 stroke crosshead type diesel engines obtain higher combustion efficiency vrs 4 stroke trunk type engines, while producing more power per combustion cycle. This is mainly due to crosshead diesel engines aren’t hampered by stroke to bore ratio limitations like 4 stroke trunk type engines suffer from. The longer the piston stroke, more power is extracted from the heat of combustion as the expanding exhaust gas can impart more downward force longer, thus more torque to the crankshaft throw is imparted, which in turn performs the mechanical work of a rotating crankshaft. Large slow speed engines have a typical stroke of 8.5 to 10 feet, with the piston & its rod reciprocating vertical. The piston rod is connected to a crosshead, as it accommodates the oscillations of the upper connecting rod while the big end orbits around with the crank throw pin. In a trunk engine, stroke length of the crank throw combined with con-rod oscillation over its length from piston to big end, has the limitation of not striking the cylinder wall. Every diesel engine has the majority of its power developed where maximum piston velocity occurs during the power stroke, typically its around 90 degrees ATDC. Large slow speed main engines are direct reversing … meaning the firing order can be changed which in turn will change the direction of flywheel rotation. Example; in-line 6 firing order is 1,5,3,6,2,4 for clockwise rotation to go ahead. Changing the order to fire 4,2,6,3,5,1 will cause the crankshaft to rotate counter clockwise, providing astern direction. On older engines this is done by either rotating (90 degrees) or sliding the fuel pump cam to another set of lobes. On current “cam-less” engines its done electronically via manipulating hydraulic devices that would take way too much time to explain here. Because of the engine’s physical moving parts size (6 foot long crank shaft throws orbiting around 3 foot diameter main journal bearing pins, 3 ton oscillating 8 foot long con-rods, with 1 ton reciprocating crossheads and a 10 foot long piston rod weighing 2 tons, all comprise each cylinders running gear) material of the rotating mass inertia and harmonics are what dictate the rotational speed range of the flywheel. Which on large slow speed diesel engines coincides with the efficient speed of the propeller (aka, screw). For the largest of slow speed diesel engines, they tend to max out at 102 RPM, with slightly smaller bores and much shorter stroke engines maxing out around 120 RPM. Both numbers mean very little with respect to fuel consumption per distance travelled unless compared to the propeller curve. As the actual engine load and developed cylinder mean effective pressure are taken into consideration. Not following the prescribed PM schedule and/or operating a main engine over loaded in the prop “B” zone for an extended period of time, lead to component failures. So, a ships engine power requirements stem from the need to rotate the propeller and the propeller size/blade pitch are predicated on the vessel size and designed service speed. When required horse power is determined, its the cart before the horse method. Modern slow speed crosshead and medium speed trunk diesel engines are built to burn the dregs of the crude oil refining processes. There are large slow speed dual fuel diesel engines that can burn a high percentage of methane gas using a diesel injector pilot arrangement for combustion of both but unless LNG is the cargo, there currently lacks a full global commitment of infrastructure to support gas consumption at this time but markets are developing and methane is the future. But for now, they are incinerators burning the by-products of consumer useful fuels. Its called HFO (heavy fuel oil) with a viscosity index number (ie. HFO 380), which is basically an unstable blend of asphalt with lighter distillates and full of impurities that requires extensive processing on board the ship prior to injection and combustion. This is done by heating, centrifugal separation and filtration. However IMO (International Maritime Organization) via international treaties have imposed limitations on HFO sulfur content globally and established zones where either ultra low sulfur (distillate fuel only, like #1 fuel oil), fuel must be used or exhaust scrubbing systems be employed which also help vessel operators meet IMO global regulations for Nox and PM emission limits. In California and elsewhere local environmental laws impact normal plant operation, several operators utilize “cold iron” where they shut down the ships power generating diesels and plug into the grid via a source on the dock using a retractable power cord. Might as well mention how main engine exhaust gas generates steam in a stack boiler, used to heat the HFO and which can be (is on some plants) used to spin a stand alone steam turbine generator, which supplies a main power buss, that in turn can apply power to the main diesel engine propeller line shaft motor/generator arrangement …. which can also generate electrical power to the main buss depending on total refrigerated container electrical load while keeping the main diesel generators secured. In other words it can be operated as a generator driven by the main engine to keep other diesel engines off line or operated as a electrical motor to impart power into the propeller shaft so less fuel needs to be consumed for propulsion, depending on the total electrical load and desired speed of the ship to meet its cargo delivery commitments. Typically on modern vessels 4 licensed engineers with the assistance of 3 unlicensed crew members hold the responsibility to keep the plant in operation and perform the engine maintenance. On modern ships when they arrive in port, its time for the engineering staff to hit the deck with tools in hand to perform main engine inspections and overhauls. Its rare to get ashore. I’ve been a licensed marine engineering officer since 1975, holding a globally recognized endorsement for unlimited HP as CE for both steam and diesel propulsion modes. I’ve worked in several shipyards in Europe, America and Asia along with witnessing large slow speed engines being built at HMD in Ulsan Korea, and hope the above has helped fill some gaps the article may have created. I’ve worked in a few refineries too, so I’m looking forward to your fuel article … roll of eyes, with a smile. Red Beard, I don’t know if you are a regular follower or tipped this way from one of our readers due to your experience, if so, welcome aboard (pun intended). When all is said and done, its still profitable business that foots the bill for these engines and indeed, the very ships that they are in. As a for instance, the Baltic Dry Index (BDI) 200 DMA weekly over five years long term trend, is down and has flat lined. The Diana Shipping (DSX) five year weekly trend is down and has flat lined. Finally a small ray of hope, with Hapag Llloyd (HLAG) which has slowly been grinding up, but has flat lined since this past Autumn. So much for the “synchronized global recovery” fairytale. Many of these ship building maritime long term loans, will find themselves underwater (pun intended) if global commerce conditions get any worse. Along with their creditors (banks) that hold the loan paper. Could be that will be all they own at the end of it – worthless paper. Banks have probably sold that off too, the criminal FED bailout gave them their out opportunity to sell into strength. Very interesting – so few places can make these crankshafts! smaller engine teardown, still impressive! Great piece. I would like very much if something like this was a regular feature on wolfstreet. MC01, are you getting the message? This was a amazingly wonderful posting – many thanks from me too for the time spent in pulling it together. Very informative and very enjoyable read. Thank you.. These are fuel-injected 2-strokes, no doubt. That makes a huge difference concerning the unspent fuel emissions that gives the typical 2-stroke it’s reputation. Two stroke diesels have always been fuel injected. When Doxford, JuMo and Detroit Diesel started to make them popular mechanically-actuated unit injectors were used, just like on ordinary diesels. Then came Electronically Controlled Fuel Injection (EFI) and finally Common Rail. By contrast the challenges of making an FI two stroke otto cycle engine are huge. The reasons for this is that in a two stroke diesel the crankshaft bearings are lubricated by pressurized oil, just like on a four stroke. By contrast an otto cycle two stroke engine needs oil mixed with the fuel air mixture and circled through the crankcase to lubricate the bearings. This leads to the reason why two stroke are such dirty engines: a large part of that oil/fuel/air mixture is dumped back into the atmosphere. Fuel injection for otto cycle two stroke engines have always been a sort of engineering Holy Grail. Honda, despite their general lack of interest in these engines, was the first company to have a workable EFI which they used on some racing motorcycles in the 80’s. In more recent years Kokusan Denki developed a three-injectors system for two stroke engines which showed some promise and was commercially used in some commercial motorcycle engines before the plug was pulled due to a change in ownership. Stihl of Germany is presently the only manufacturer offering a commercially available otto-cycle FI two stroke in form of cut-off (concrete) saws. Great contribution. And I thought making optical cables eas the marvel of engineering. Can domeone write such contribution? I am not Happy with those sort of sensationalist numbers which is why I asked for truthful unbiased ones. I worked on a Four engine salvage tug, with detroits for a while, we used tons of diesel an hour. when working, those numbers dont sound wright. The emissions from those bunker fueled container vessels are bad, but not that bad. The emissions are really, really bad, as attested to by the soot we get through our windows here in San Francisco. The winds nearly always come from the West (Pacific). The nearest industrial installation west of our building is in Japan. We have one of the windows open almost all the time, and the amount of soot that settles on the window sill in just one week is just stunning. We suspect that it is from the shipping traffic into and out of the Bay. The container ships going to the Port of Oakland pass about 1.5 miles from the window. The tankers to and from the refinery terminals in Richmond pass by several miles away. Other bulk carriers vary. Yes re: SF soot. Not to mention the West Coast version of the “Paris Hack”. They are most defiantly obscene. The point being you can not have a real debate based on false numbers and half truths unless you are P 45 and all that is false goes your way. I have plenty of, Torque, Hp, Fuel consumption per hour, at any given rpm charts, for small marine engines. Which can be used to calculate the emissions with reasonable accuracy for entities that will not give out that data. That accurate information for the engines in question, is there, it is just very difficult for the non-connected to obtain it. For the reasons your nose, in proximity of your open SF Bay window, tells you. Try sailing behind one, on the downwind side. BE CAREFUL how you clean and dispose of that soot. All the nasties in crude that are not wanted in anything else, and not destroyed in the combustion process, end up in that Soot.. In the bay the engines will not be at premium operating temperature, and speed, so emitting more unburnt fuel. In our Harbour (One of teh best boating Harbours in the world) we are lucky, predominant winds, are offshore. Wolf, how close are you to the Bay Bridge? The trucks pouring over there could add to the soot. We’re above Aquatics Park, about 2.5 miles or so north-west from the nearest part of the Bay Bridge. And since the wind almost always comes from the west, the nasty stuff from the Bay Bridge is not something we have to worry about, thank goodness. This is something I can relate to. 22k lbs./hr is about 230 tons/day which is close to what my ship consumed per day. This link has numbers similar to the LiveBunkers link I posted a week ago in response to MC01’s comments on the ‘Freight Costs, Volume, Demand …’ feature which triggered this feature on engines. It also mentions the Emma Maersk which I did some calculations on as I posted earlier. Assume that the Emma Maersk is running its 14 cylinder engine at 60% of its potential power output and is running at a high efficiency, but not maximum efficiency; say it’s at 170 grams of fuel per kiloWatt hour. One day’s fuel would be 196 cubic metres, but if one visualizes two 53″ semi trailers fully loaded, that’s how much is required. As others have commented, bunker fuel is nasty stuff that’s left over from refining oil. Asphalt, and roofing shingles also are made from the leftovers at the refinery I reckon. They can make coke from bunker fuel. Turning it into Coke dose not take the emissions away, just moves the places the emissions are made. They use 2 stroke engines on container ships? Speaking from my experience with smaller but still large engines (3000-6000 kw for locomotives, where EMD had to abandon its 2-stroke diesels), I think that environmental regs may require the replacement of those engines sooner, rather than later, particularly at places like Long Beach, where (entirely justifiable) accusations of environmental racism are becoming more common. How do they start these monster engines ? With a smaller “Start Engine”. Literally a “Starter Motor”. Generally an air-start system is used, like on many larger diesel engines: electric starters are just impratical for engines this size and with such high compression and hydraulic starters, albeit well suited for large diesels, would add a layer of un-needed complexity for no real benefits. While similar in principle to that used on lorries there are some significant differences in how the compressed air is injected into the cylinder to force the piston down. There are also procedures to be followed when restarting the engines to ensure there’s no moisture buildup in the cylinder, especially if the ship has been laid up for any length of time. Great post and comments; thx, all, and especially MC01. The photo really brought this story to life, and I hope that the follow-up posts on related subjects are accompanied with photos. Looking forward to the follow-ups ! No cruise ships are being built this way anymore, they all use electric-drive azipod thrusters. This allows for multiple engine/generator rooms that can be spread thru the ship for redundancy. Ditto icebreaking LNG tankers. Add bow thrusters, and expensive tugboats aren’t needed. When scale becomes an issue for an older technology, it’s time for a rethink. Thanks MC01and Wolf for hosting. As I’m a curious old fart I like any and all interesting topics. I may write an article some day for submission on my almost 60 years of collecting coins(1959-1965), accumulating precious metals(1973-2014) and dealing coins, paper money, bullion(1978-2014).